Random Variance Score- shows the results random variance had on a player’s 2011 season and the probability that a player will exceed or regress in 2012. Scoring is a -5 to +5 scale that measures several sabermetric categories that reflect if a player is prone to regression. The Mayberry Method- a 0-5 scale of a fantasy players Power, Speed, Batting Average, and Playing Time. Health & Age- Player is given a score A to F based on the combination of health history and age/regression. Another MVP Caliber year for Cabrera. The 2011 AL Batting Champ hit .356 in the second half leading a well rounded Detroit team to the AL Championship series. I don’t see the move to third hurting him much. I could see a slight drop in power numbers with all of the weight he has dropped to play third. He is in the middle of his prime, and with the addition of Prince Fielder I see a better pitches coming his way. His contact% has been on 4 year incline. You can count on .300-35.100. Longoria is young and his elite potential is still on the rise. I would not be too concerned about injuries. Batting Average took a hit in 2011. I would expect a rebound, and if he can get 550+ AB, expect 35-40 HR Power. Showed great PX and xBA. 2011 was a year to forget for Hanley. Injuires and clear lack of motivation made him almost worthless to fantasy owners. I have never bought into the hype surrounding Ramirez. He has had only one great season (2009: .342-24-106, 27 SB). I think he can be a nice player, but when the “experts” call him elite I just laugh. His entitlement toward himself is enough to scare me away from him. Ramirez is a classic case of High Potential. If he could show his talents you might see a season that look like .350-40-120 with 35+ SB. He reminds me of a former High Potential, unmotivated player I remember from St.Louis named J.D. Drew. Beltre showed us 2010 in Boston was no fluke. He hits in a powerful Texas lineup that gives him plenty of chances to drive runs in. My main concern when I evaluate Beltre is his injury history. He missed August last year with a bum hamstring and had a nice injury history before that with Seattle. I feel Zimmerman is very underrated. He has 35+ HR power, and can hit .300+. At 27 he is entering his prime with a lineup in Washington that is only getting better around him. Injuries have been a hurdle for him lately, but he is healthy heading into 2012 and should continue to put up premium stats. Ever since taking a 93 mph fastball to the head in August of 2009, Wright has showed a steady decline. Not the Elite player that many thought he would be, but is still a talented 3rd baseman. 30 HR power, BA in the .280 range, and steals 15 bases is a nice piece to have on your team. Being on the wrong side of 30 has not fared well for Youkilis. Since 2009 he has been on a downward trend that took a huge dive last year when injuries came into the picture. He still put up .818 OPS, but with the high risk of injury don’t expect 25+ HR power to come back. Sandoval came back huge in 2011. At 25 years old, you can only hope the sky is the limit for this rising star. The metrics show 30+ HR potential and with a .315 average could bolt him into the elite discussion. Lets see how 2012 turns out before we crown him, but it should be fun to watch him continue to develop. You can no longer consider A-Rod elite. You can’t count on much with the declining trends, injury history, age, and overall regression. He still has the potential at his age to hit 25-30 HRs and drive in 100, but staying on the field is the issue. Even with injuries, Ramirez has been able to slug 25+ HR for the better part of 4 of the past 5 seasons. He hit .306 and hit 96 RBIs on a horrible Cubs team last season. With the Brewers, I could see him picking up some of the slack Prince left behind. If you would like to explore more in-depth about Advanced Metrics, here are some amazing resources/people that have made a priceless impact on the way I evaluate players and it has shown in the success I have each year. I do not get any kick backs from this list, just like to promote great materials/information when I see it. Tulo is everything you want in an elite fantasy player. Tulo has yet to reach his ceiling. 40 HR and 20 SB potential all while playing Shortstop and hitting .300+ .The metrics and trends clearly show we have yet to see the best of this elite player. 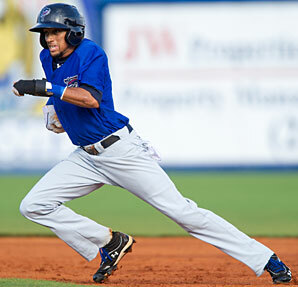 Through the first half of 2011, Reyes looked healthy and was on his way to a career year. He was on pace for 60+ SB, 90+RBI, 20 HR all while hitting .337. All those hopes for Reyes owners were crushed when his hamstring blew up before the allstar break. Even when he came back he was not the same player. Over his career, Reyes is the classic High Reward/High Risk player. Switching leagues and getting paid might have some negative effects on him getting a fast start. The new ballpark in Miami is suppose to be a pitchers park which could lead to a lot of XBH. He is only 28, and being in the middle of his prime you can expect big stats if healthy. At 21 years old, Elite Speed with a .300 average is a great foundation to have. The trends show that power will develop over the years but I could expect 15 HRs in 2012. If he gets the right manager that will give him the green light, 50+ steals are in his realm. Great CT% shows the average is legit. Castro is a great keeper to hold onto and build your team around for years. A healthy 2011 showed great progress from a 2009 season. He saw more Fastballs in 2011 than ever before, which could show where some of his power came from. The trends do show 10-15 HR power. Besides the power every other basic stat fell inline with the metrics. Projected 2012 ceiling would be .270-15-90. There is a lot of hype surrounding Aybar in the Fantasy world. I have seen projections as insane as .335-20-100 with 55 SB. I am not on that bandwagon. Don’t get me wrong, I think Aybar will have a nice season. With Pujols and Morales entering the lineup, Aybar should have beter pitch selection at the plate and more chances to rack up steals on the basepaths. Aybar has only hit over .279 once in his career. With his SB metrics dropping in 2011, 50 plus stolen bases are a stretch. I see Aybar gaining a lot in Runs and a spike up to 40 SBs. He produces across the board which makes him valuable at SS, but he is not “great” at anything. I am starting to wonder if this is as good as it gets for Andrus from a fantasy prospective. If defensive stats where big in fantasy, he would be elite. He has zero power, hardly hits .279, and his baserunning metrics dropped in 2011. With his talent I would expect 50 steals, and that would be enough for me to draft him higher. BUT he has not shown that talent and I am starting to wonder if he is not over-hyped. Shows 20+ HR power. Can hit in the .270-.299 range. OPS was a nice .827. If Peralta could steal 15+ bases and be more consistant, he would easily be a top 5 Shortstop. The problem is one year he hits .249, then the next he is .299. One year he will hit 24 HRs, then he drops to 11. With Prince in the lineup, you can hope Peralta is in a better position for success. In my book, Ramirez is a huge letdown. After his 2008 season, there was hope he would produce 30+ HR power, steal 25+ bases, and hit over .300. Those projections are long gone. At 30 years old, he has acted like a player on the wrong side of 30 the past 3 seasons. As he continues his decline he is just average across the board. The 30 steals in 2011 suprised me, but I don’t expect 30+ in the future. With a 33 year old Rollins, you can expect 15-20 HRs, 20 steals and a .260 average. Regression metrics are showing 20% decline every year past 33 for Rollins. The only other player besides Tulo to show 30 HR power in 2011. I wouldn’t expect 30 HR this year, but if healthy he can easily get you 20-25. I like Hardy do to the power potential and he normally holds a BA around .270. His CT% has held steady, but health issues might spark regression. He is a nice MI option, and a cheap source for power. Cano has so much upside it’s hard to ignore. He has power, average, and is in a monster lineup. He did take a minor baby step back in 2011. OPS, Contact rate, and FB% all took a drop. I would not be concerned, you have 3-4 strong prime years with a guy that plays a position with weak talent. I don’t think he can compete for a batting title, but he will hit .300-30-100. When healthy, Kinsler is the elite second baseman. 2011 showed what a healthy year can produce. The great news is that he is due for an even bigger year in 2012, if he can stay healthy. At 30 years old we have no idea how injuries will continue to effect Kinsler, but 30-30 potential and hope that .300 batting average can come back would make Kinsler a top 15 fantasy player. Pedroia put up very similar numbers to his 2008 MVP season. His first 20-20 season and a huge second half stat line .339-14-56. The trends show Pedroia could take a step back in 2012. Being in that very dangerous Boston lineup, I could see the opposite take effect. At 28, Pedroia is a safe pick. Zobrist had another solid season. At 31, regression is always a concern. He has a healthy OPS, and runs the bases well. A solid middle infield option. Being on the wrong side of 30, regression has hit Phillips that past few seasons. He is no longer a 20-30 HR threat. The days of 30 SB are gone. What you are left is an aging hitter that will hit .285-15-70. Still not a bad stat line for a middle infielder. His regression rate is similar to Orlando Hudson when he hit 30, Phillips obviously has a better skillset. When healthy, Utley has an elite skillset for the second base position. He plays the game hard, sometimes too hard. You have to have faith that he is going to be healthy if you select him on draft day. In the second half of 2011, you saw him gain power as he stayed healthy. He also ran the bases well as the season progressed. I see a BA rebound, and you can expect 20 HRs, and double digit SB. Great combination of Speed/Power/BA. The trends show that we have not seen the peak of his power yet. Qualifying at 2B/OF, you can not get a better value pick than Kendrick. Last year I passed on drafting Weeks because I was afraid of his injury history. I was right, but again I was wrong because I drafted Tsuyoshi Nishioka instead…. I was trying to stay under my league cap…my bad. Like Utley, Weeks is another example of great talent that can’t stay on the field. 30+ HR, 25+ SB, and 100 RBI potential that we have been waiting for since 2007, but we only got a short look at it in 2010. He could be the only big bat for the Brewers this season with Ryan Braun a facing PED suspension. Classic High Risk-High Reward. Had a great second half, .290-24-54. Buy the Power, 30-35 HR potential. BA is on a huge decline, and regression trends are picking up. He is the Mark Reynolds of second basemen. Continuing the trend of talented Second Basemen that can’t stay healthy, Meet Brian Roberts. This former 18 HR, 50 SB, .314 hitter has fallen pretty hard. Unable to stay healthy, because he can’t take his PEDs *allegedly*, Roberts has only potential that keeps him in the discussion of top second basemen. Like Joe Mauer, you can’t ignore potential. Let hope Roberts skills were not all a result of PED abuse *allegedly*. Looking at the stats and factoring in regression at 34, IF Roberts can get 500 AB look forward to .265-10-60 with 20 SB. Random Variance Score– shows the results random variance had on a player’s 2011 season and the probability that a player will exceed or regress in 2012. Scoring is a -5 to +5 scale that measures several sabermetric categories that reflect if a player is prone to regression. The Mayberry Method– a 0-5 scale of a fantasy players Power, Speed, Batting Average, and Playing Time. You can’t get a better example of an all around 1st baseman. He hits for power, average, and runs the bases well. He hits both RHP and LHP, and his walk rate shows pitchers fear him. In 2011 he showed a power surge in the second half, 18 HRs. We have yet to see the best from Votto. With Prince signing with the Tigers, I am still dumbfounded on how he is a good fit for Detroit. I see how they needed a replacement for V-Mart, but I am still searching how a $214 mil makes them better than they were in 2011. 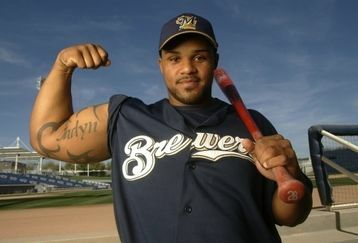 Fielder will obviously play 1B/DH, so that adds a valuable DH to those AL Leagues out there. His ceiling in the past is .299-50-141. Changing leagues and moving to Comerica Park, I see a “down” year for Prince. The biggest drop will be in his power. He will have to hook a lot of balls to right. He also goes to a lineup with a lower OBP, and less speed. That equals less RBI oppurtunities and a higher walk rate. Count on .270-30-100, which is still a great season….just not $214 mil great. Pujols had his worst season .299-37-99, which would be a career year for majority of the league. The Angels lineup should provide equal if not more RBI opportunities for Pujols. Random Variance shows he is due a rebound, +2. Pitchers seemed to have found a way to pitch him by pounding him inside. It showed by him receiving the fewest intentional walks he has ever received in a season. With Pujols regressing, it is safe to say he will have great year in 2012, but he is 32….Allegedly. The overall numbers show that Gonzalez had a career year, OPS of .955 and BA of .338. Had a drop in power, which has to be due to the comeback of shoulder surgery. Fenway Park is built for him, I could see a healthy Gonzalez having a shot as the top fantasy 1B in 2012. From what I hear from the “experts”, Teixeira is undervalued by fantasy owners. His falling batting average (.308 in 2008 to .248 in 2011) and declining OPS does not warrant him to be a top 5 First Baseman. He does have elite power, hits in an All-Star linup, and the metrics predict a bounce back year in 2012. At 32 he is a safe pick for now but I would not invest in a big way on him. You can’t get a better keeper pick than Hosmer. He is compared to Joey Votto often. He is doing more at 22 than Votto was doing at 25. I would overpay for this talent yesterday. His ceiling is .330-40-110. Howard’s torn ACL and declining numbers in 2011 suggest we have seen the best already. Now as age settles in, be ready for the fall. I strongly believe this will be his last season in Philly. His elite power will be the only true asset to invest in. Keep track on his rehab, hopefully he is ready for Opening Day. Berkman showed what he can produce when healthy. All of the metrics show the numbers are solid and that if he can stay healthy you should expect a repeat. I would not expect 500 AB and he lost the protection of Pujols in the lineup. The move to Firstbase should limit the chance of injury. Napoli was the MVP of the second half, hitting .378-20-50. Obviously, hitting in Arlington and in that All-Star lineup has helped. He is still in the same position coming into 2012 to continue his breakout. My only concern is his health. Playing in the Texas heat has proven to be a factor for players. With him reaching the 30 year old mark, you would hope Washington puts him at DH in Late July and into August. One of the more consistent catchers in the game over the past 5 seasons. I would take note in the oblique injury that he suffered in 2011. There are reports of possible effects that could resurface in 2011. You should expect the usual 70+ RBI, 20+ HR. 2012 should be a big year for Santana. He has 35-40 Homerun, 110+ RBI potential. He is an asset that I would try to keep and hold onto if you are building the core of your team. One of the most underrated players in fantasy baseball, Montero quietly put up 18 Homeruns, 86 RBIs, while batting .282. He is in his prime and on a very good Arizona team that is on the rise. I could see his batting average drop some, but his power potential is 30 HR. I admit, I almost gave up on Wieters. So I kept him last year and gave him one last shot and he made it well worth the wait. Displaying that power that we all heard about, he his has 30-35 HR potential with a chance to drive in 100 RBIs. Continuing the trend of power surging catchers, we welcome in Mr. Avila and his 2011 breakout season. 10 HR in the first half and 9 in second shows the power is legit. The metrics show that his batting average will not hold up, but at his age I see a lot of growth still ahead. Coming off such an ugly injury, it is hard to really predict what Posey will do in 2012. The injury will hurt his power, until he regains full strength in his lower body. I think it is conservative to say his projections for 2012 will be .255-10-60. In deep keeper leagues it is still worth paying for the “Star Pedigree”, just be patient. You can bet on an average hovering around .300 for Molina. What we saw last year was a surge in his power numbers. Even as a cardinal fan, I don’t put Molina in that “Elite” category. He is Elite behind the plate, but at the plate he is All-star worthy but not Elite. Catchers are like running backs in football, and guys like Joe Mauer and Buster Posey prove my point. To be honest, I thought about leaving Mauer out of my top 10. He made it on pure potential alone, because he has shown me nothing. What he has shown is an aging player, that is overworked and can’t stay on the field to justify that mega contract the Twinkies threw at him a few years back. Here is a tip when it comes to evaluating catchers: When a catcher begins to have lingering back or leg/knee problems, run as far away from them as possible. I was jumping off the Mauer bandwagon after the 09 season when his injury problems started. I would only take a shot at Mauer LATE in the draft. Consider it a favor to your team when the rest of the league drafts him with a top round pick. I have been waiting for Suzuki to have that breakout season since 2007. It has to happen this year. The potential shows 20+ HR power. His batting average has fallen almost 40 points the past 3 seasons. At 28, he is in the prime years, lets hope he makes the best of it. After a long hiatus due to family and job changes, I am back. So lets get to work. Your 2012 Fantasy Baseball season is approaching fast. Most leagues will draft in March and there are many formats to play on. I enjoy the traditional 5×5 Roto League. There are many spinoffs to the traditional Roto-Style, but they all have the same base. If you are in a Keeper League, you are examining your roster and the possible draft pool. I feel for the Ryan Braun and Victor Martinez owners out there. Between now and opening day, there will be a variety of subject matters that I will break down. Everything from the Minor Leagues, International Talent, Draft Formulas, Picking a League, and everything in between will be covered. If there is anything that you the reader would like to discuss or if you have a questions/comments, feel free to contact me via twitter @KStafford32 or comment below. – Ryan Braun shooting up??? Being a “Baseball Traditionalist”, I love guys like Ryan Braun, or so I thought. None of this is good for the game. Players must continue to be held accountable for their actions. I am for even greater penalties, but that is for another article. His torn ACL takes away a guy that qualifies at so many valuable positions for deep leagues. Martinez also provided valuable protection in that lineup for Miguel Cabrera. Going to be a long summer for Detroit Fan. Am I the only one completely shocked that here we are in the middle of January and Prince Fielder is still a Free Agent? If the Nationals do sign him, as I predict, the NL East will be the most compelling division in baseball. Yonder Alonso, Carlos Quentin, Edinson Volquez, Houston Street, Andrew Cashner all added via trade this offseason. It has to be exciting being a Padres fan for 2012 and beyond.